Today we had people who tried by all of the means available … to injure the Republic, to damage, to destroy, at the risk of killing. Saturday, we saw extreme violence in Paris. It was almost para-military groups, looters, zadists. Before, the black blocks frightened everyone, now they are taken as a plus. It is they who make things move forward; we, we were too pacifist. 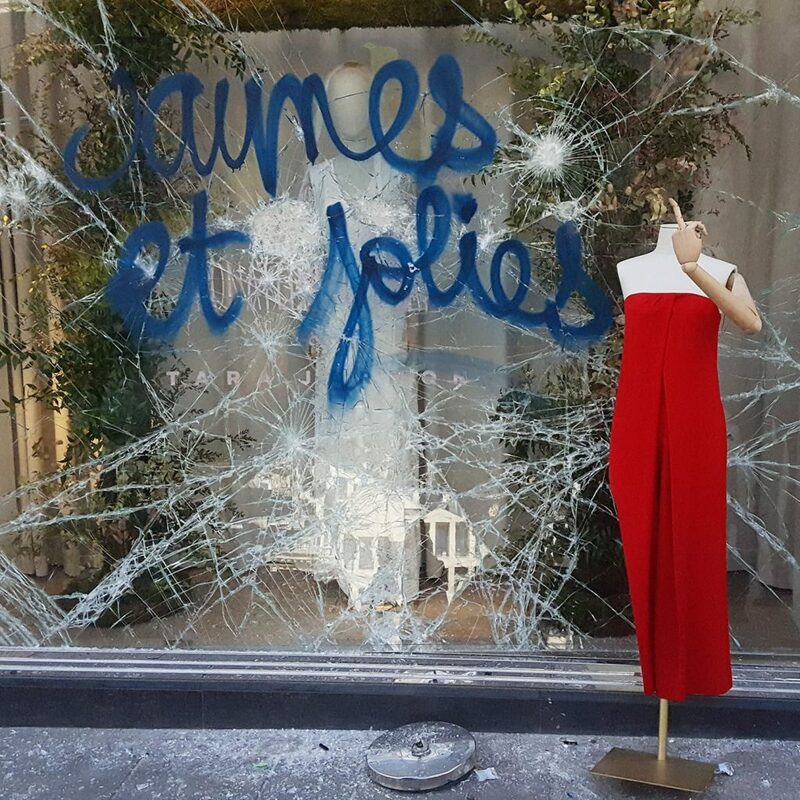 It’s great that things are vandalised because the bourgeoisie are so sheltered in their bubble that it is necessary that they feel fear physically, for their security, for them to give up. Our own title then is meant to clarify matters. Act XVIII of the yellow vests was concentrated in Paris, with a confluence with other protests in the city (most notably, against global warming). It brought part of the capital to halt, vandalised symbols and institutions of wealth, and in forcing once again that hand of the government (the president was forced to cut short his skiing vacation), the movement continues to radicalise in a seemingly endless and growing challenge to political and economic authority. As Macron’s ministers throw responsibility for the violence on “organised radicals”, accuse each other of mismanagement, and then promise even more draconian security measures (with the famed national debate rapidly fading into the background), for those who continue to contest and create, the answer is increasingly to continue to rebel … for what is there to return to? It’s done: March 16th will remain engraved among the important dates of the yellow vests social movement. Faced with the violence of political, media and economic reactions, it is necessary to say things clearly, without hypocrisy. Let’s start with the factual: it’s true, many GJ [gilets jaunes] came to Paris for this act 18, in order to overrun the system and undermine the management of “public order”. They may not have been in the majority, but they were quite numerous and determined to achieve results. These thousands of GJs did not all have a black bloc tactic. There were many early GJs with only their vests, masks and protection goggles. There were also some protesters en bloc, whether in a black k-way and/or in a yellow vest. Above all, all of the protesters were totally involved in the demonstration of the day. No split has ever appeared between groups of “nice GJ” and “bad rioters [casseurs]”. The vast majority of the demonstrators present supported or, at least, accepted the offensive actions, without necessarily wanting to do the same. Several videos show that at the Place de l’Etoile, in the middle of the morning, the arrival of a block of thirty protesters was greeted by a sort of guard of honor and applause. So yes, it shocks you and perhaps disturbs you. But this is the reality of France in 2019: tens of thousands of citizens today agree that the struggle is to be carried out in an offensive way. You can discredit them, call them rioters, accomplices, ignorant trash or racists. You can try to take away all of their humanity. But the reality is quite different: it is not for pleasure that these people accept (and / or encourage) violent actions. It is by necessity. It is not for the violence in itself, but for its consequences in the social struggle. Consequences which are inevitably uncertain and sometimes dangerous, but which constitute a more positive horizon than the current social status quo. Sincerely, deep down within you, do you not see that it is because of these excesses that Act 18 has had a very significant impact in the political and media world? That the same number of demonstrators in a legally declared demonstration, where “nothing would have happened”, such a demonstration would have been completely ignored and despised by these same politicians and media? It is not the GJ who can only understand the language of violence and power, it is the whole current system. In this society where you have to be the most ferocious and the most powerful possible, how could one hope to change the situation by remaining weak and docile? The mass media are interested in the movement only when it offers them “sensational” images to make ratings. Two days before Act 18, a meeting was held at the Labor Exchange between movement figures and intellectuals. The Exchange was packed and hundreds of people stayed outside. Why not talk about this constructive and peaceful initiative? Why, for several weeks, have thousands of GJs been gathering in the cities without media interest? Because there is nothing left to “sell” to viewers. On the political side, in 17 weeks, the only period in which power seemed to make concessions was during the most violent acts of late November and early December. There, as if by chance, after almost two months during which power has completely denigrated the social question and the yellow vests, Macron shortens his vacation to take things in hand. We know that he will not take social issues head-on and that he will address the issue of GJs solely through his lens of violence. But at least, the question is back on the table. Let’s be lucid: political power does not respect the deep reasons for the anger of its people. What interests it is to calm this anger, for its own tranquility and that of all the powerful. Macron says that those present yesterday on the Champs Élysée want to “destroy the Republic”. Because the Republic is Fouquet’s? Cartier? The banks? This government, like the previous ones, denigrated millions of citizens, leaving them to fall into an increasingly unsupportable precariousness, even as the billionaires continue to get richer and richer. During the the four months that the yellow vests have struggled, how many people have been made unemployed by their company to make more profits? How many retirees have fallen further into precariousness? How many patients were unable to benefit from necessary care, for lack of means? How many deaths did this liberal politics generate in four months of struggle? The figure is impossible to know, but it is obvious that it is colossal. Ultra-liberalism kills, injures, destroys lives and families. It’s not about “big words” to make snake oil. It’s totally factual. And many yellow vests in the countryside or in the suburbs know it very well indeed, since they live it daily. So if you think that citizens who destroy a bank or build a barricade are enemies of the Republic, but those who dismiss and enrich themselves on the misery of these same citizens are the friends of the Republic, even their protectors, we have a totally different vision of what the Republic should be. If the violence of a ravaged luxury store bothers you much more than people who die or fall into misery, then yes, we do not speak the same language. Your blinkered morality is not the one that inhabits us. To be moral selectively is to be immoral. You are immoral. And while you treat the GJ as enemies of the Republic, they will remain much more moral and much closer to the values of the Republic than you. Stop being offended by the violence of a social movement when you deny it and ignore it completely, except in the case of violence. Only then can we discuss morality. This entry was posted in Commentary, News blog and tagged france, gilets jaunes, insurrection, revolution. Bookmark the permalink.